Do you breed Bengal Cats? Join and be a member. 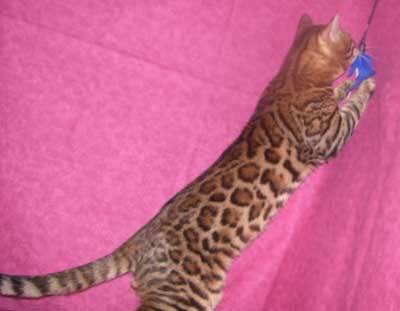 I am a small breeder in MN striving for the bengal type along with nice rosettes. If you're looking for good quality, nicely rosetted silvers and browns, you've come to the right place! Feel free to look around the site and check out the links with lots of great information. The Webmaster makes no promises or guarantees, direct or implied, about any of the Catteries that are listed on the Exotic Cat Network. All transactions between Breeders and Visitors to this and other Exotic Cat Network sites are the responsibility and at the risk of all concerned parties. We strongly recommend potential cat owners to become educated about finding and working with responsible breeders.